After eight years, Mayday Parade is now in the tier of constantly discussed alt rock bands, and the band has fully developed a sound that is uniquely theirs. The Floridian quintet is incessantly talked up on news sites about new tours, new singles, etc, that it would be understandable to accidentally glance over the news of a new MDP album; the band is always busy. As seen on the band’s third and self-titled record, Mayday Parade has defined their own musical style; it is easy to decipher a MDP track solely based on a guitar riff and certainly by Derek Sanders’ easily distinguishable vocals. Mayday Parade keep the continuity afloat with their fourth full-length, Monsters In The Closet, while concurrently branching a few inches out of their comfort zone. 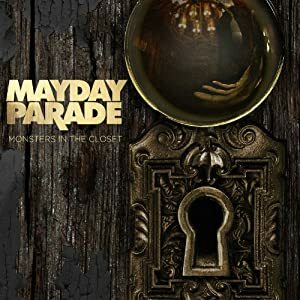 There are two ways to view Monsters In The Closet: concluding that the majority of the album sounds like a continuation of previously released Mayday Parade tunes and loving it, or realizing that this monotony makes you dislike it. You have to give it up for Mayday Parade, though. Derek Sanders immediately stepped up to the spot Jason Lancaster abandoned after the recording of A Lesson in Romantics , and the band has flourished into a top-rated and quite successful pop/rock act since then. They wrote songs no one can resist and ones that immediate evoke group sing-alongs. But it almost seems as though Mayday Parade have reached a slightly inclined plateau in releasing Monsters In The Closet. Meaning, the band shows some growth and some experimentation in the new songs, but otherwise, the record is a safe continuum from their previous releases. There are numerous highlights to Monsters In The Closet, dubbing the record a must-listen for any level of MDP fan. The previously released track, ‘Girls,’ can be filed under the large folder of Mayday Parade songs that get stuck in your head for days on end after just one listen. The song combines typical MDP styles as well as some early The Starting Line influence in the light pop punk/pop rock melodies and Sanders’ high tenor. “The Torment Of Existence Weighed Against The Horror Of Nonbeing” is composed in a bright key, a happy 6/8 time, and features lighthearted “La-La-La-Da-Da’s” that juxtaposes the morose, brokenhearted lyrics (“Cause we all find love when we fall/And we say that it means the whole world/It means nothing at all”). Similarly, “Even Robots Need Blankets” features a light piano melody that gives the feeling that this is another depressing, piano-based MDP song (and you’re waiting for Jason Lancaster to jump in with, “Katie, don’t cry/I know…”). But this track is a sweet love ballad that will make anyone with a heart feel all warm and fuzzy inside. And what’s a Mayday Parade record without more than one love ballad? ‘Hold Onto Me’ is one that focuses on a lead guitar, as opposed to a piano-based tune. Sanders smoothly transitions from delicate, lullaby-worthy cooing, to his typical vocal projection, to belting out every ounce of strength within him to finish out the song. That makes ‘Hold Onto Me’ one of the songs that epitomizes Sanders’ exponential growth as a lead vocalist. The band includes a more aggressive pop/rock track, ‘Repent and Repeat,’ on the record. The rhythm will get you bouncing around almost immediately. Here, Sanders shifts the volume of his voice to match the ever-changing timbre emanating most from the powerful guitars. ‘Sorry, Not Sorry’ is a breezy, pop/rock-pop/punk crossover that fits well both as an experimental track on the record as well as a change of pace. It is so difficult to not love Mayday Parade. The band helped make the sugary pop/rock heartbroken and love struck kinds of songs famous and widespread amongst contemporary alt rock. The question of whether Monsters In The Closet is a remarkable growth or a lull in the band’s journey of refining their sound is ultimately up to the listener. Nevertheless, Mayday Parade is a great band that clearly works hard to produce music they enjoy and believe in, and Monsters In The Closet is certainly a record the band and their fans should be proud of. Monsters In The Closet will be released on October 8th through Fearless Records.